We left Ban Nahin and bumped down beautiful highway 8 then headed north up highway 13 to Pak Kading. 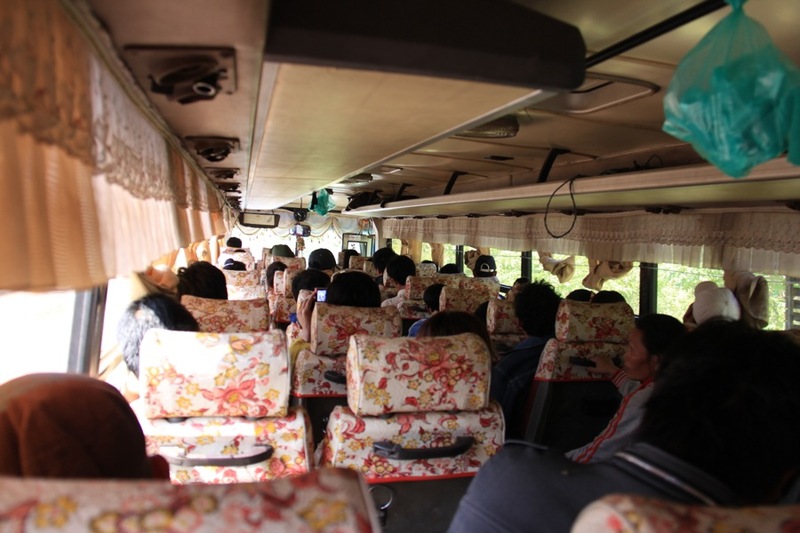 The bus was packed, cost us 50,000 Kip/$6.15, and was about 3 hours long. We were the only ones getting off at Pak Kading and were dropped off at the bridge that crosses the Kading River — not convenient since it was about a km from the centre of town (which the bus would be driving by anyway), but the river and its bridge is about the only sight in the town so we didn’t mind the sweaty trek across it. We checked into one of the two guesthouses in the town, Vilada Guesthouse (100,000k/$12.30, w AC) and spent the rest of the day relaxing. The Kading River from the bridge. In the morning, we grabbed breakfast at a place across the street from Vilada. They served up a fantastic bowl of pho and readied us for the bus ride to Vientiane (60,000k/$7.40). Vientiane is the capital city of Laos. It has a large expat community so it has plenty of restaurants that serve non-Laos food, something that we had been craving after eating Laos food for the past 2 weeks. Our first stop was to Taj Mahal for Indian food. It was tasty and reasonably priced. We spent the next few days bouncing between restaurants: Korean, Chinese, burgers, Middle Eastern, Thai, with maybe one or two stopovers for Laos food (it is delicious!). Our first night in the city we stayed at Syri 2 Guesthouse. Not the most impressive place. Our room was a windowless box with plain white walls but had AC and — oh what’s this? Bedbugs! We let the guy at the front desk know and he gave us a different room which was a windowless box with plain white walls and no AC. Sweat plus paranoia does not equal sleep. The view out of our window at Mixay Paradise. The next day we switched to our first choice (which was full on the day we arrived) Mixay Paradise. It was the same price (100,000k/$12.30) as Syri but comparing the two would be like comparing a toilet bowl to a cereal bowl. Mixay had it going on. Spotless rooms with a view over the neighbouring temple; a big breakfast that included eggs, a baguette with butter and jam, fruit, fried noodles, chicken curry and rice, juice, and coffee or tea (all for just 10,000k/$1.25); friendly staff; a convenient location; an elevator! Despite the maddening heat we managed to do a bit of a walking tour; stopping off at Victory monument (Laos’ version of the Arc de Triomphe), Wat Sisaket (the oldest temple in the city and home to over 2000 Buddha statues), That Dam (stupa that was once covered in gold), and Talat Sao (Vientiane’s biggest market). We ended our day with some frames and some beers at the local bowling alley. It’s not the most modern facility but it sure was a good time. Ryan waits for his strike. 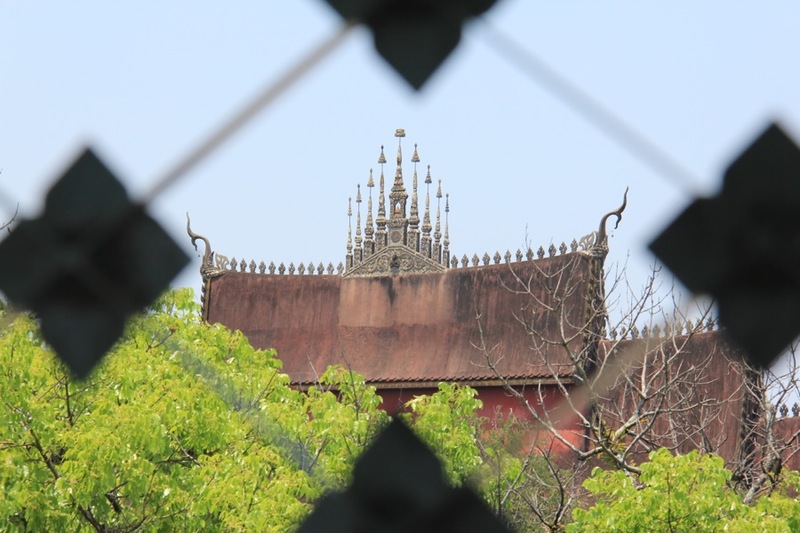 We were in love with Vientiane, but the city was about to change. 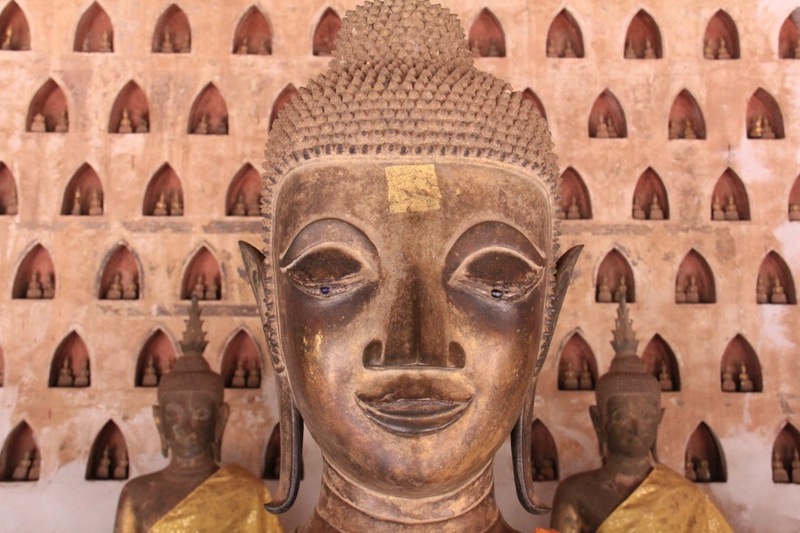 The next day was the first day of Pi Mai, the Laos New Year. The streets of Vientiane wouldn’t be the same. Let the chaos begin! Love your clip on YouTube.